like many of your photographs this is one is so tantalisingly eloquent. That is nice to hear, thank you. Yes, quite possibly – a tear for gravity of another kind… each tear full of stories. This one is particularly amazing . . .
Evan, thank you.. Much appreciated. Its own little world. Thanks, Karen. Yes, small world inside . I’m glad you think so, Scott. Very eye catching and well done! How kind, thank you, Anfree. I suspect you may have painted/drawn some of that universe, Elena! Thank you. Gracias, Manoli! Eso es muy amable de su parte. Fabulous work. A stunningly creative way to ‘view’ gravity. Thanks ever so much, Simon! Sur le Seuil de l’Action , Agit par Petite Dose . NéO, de belles paroles. Nous vous remercions de votre poème. A Christmas light…love the title. Thanks, David, I suppose it is! Magic inside…you go first, Gigi! Despite the fact that I work a lot with forms in nature, the non-photographer in me, who grew up like any other person in the 20th century and has all the usual associations with the familiar items of modern life, can’t help coming to the fore and seeing this as a light bulb hanging from an electric cord. wonderful – A fascinating series of events each day! Most people would miss it.Beautiful ! Carla, thank you. I always appreciate your thoughts. You have such a good eye for transformation and becoming – the fantastic tension (literally) makes this beautiful, Karen. Thank you, Richard – much of my work is about transformation, I’m glad you can imagine/associate that. that is amazing. ornamental ! A little faerie light maybe?…thank you, Isabella. It does look like an ornament. Or I should say that it reminds me why we have icicle/droplet ornaments. I am so far from ice and rain I forget. What is reflected in there, Karen? Is that the woods or…? Anna, it is the trees around it that are reflected. It is also partially frozen so I’m not sure how that may have effected the reflection… there could be things in there I don’t know about…. It is a glorious little light bulb, made from nature. A world encapsulated in a droplet. Each image from you is a meditation Karen!! Thank you so much for sharing your beautiful vison! Mimo, thank you for your very kind comment. Nice shot. Gravity has often times been my downfall. It seems if you focus on the outside of the drop, you can’t see what’s inside it.. so yes, the focus is purposeful. 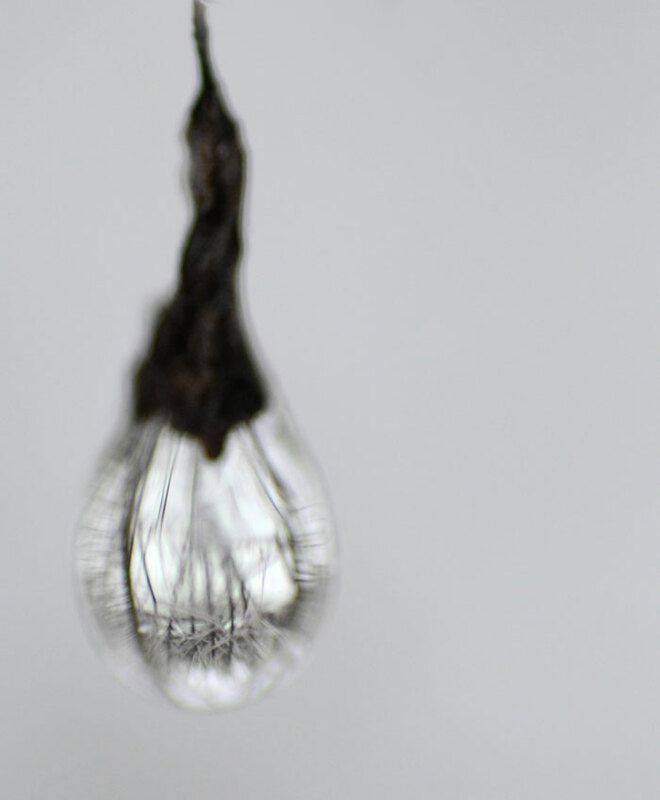 I find also that one can arrange things in the lens of the drop so that they are more interesting, by moving around. That is what I suspected you must have done for this one since that arrangement in the drop is so nice. I’m glad you think so, much thanks! The tops, a lovely drawn out shape. Oh my goodness! Exceptionally beautiful! Reblogged this on shaalannoha's Blog. Really incredible. It makes me want to sit here for a while and try to come up with something …profound aha, but as I know that won’t happen, I’ll just say that it is a wonderful piece… of pure art!